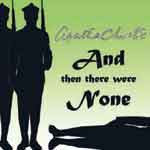 First up: Community Players' "And Then There Were None," directed by Cathy Sutliff, opens tonight, September 1, with a special preview performance. This stage version of the famous Agatha Christie mystery novel strands ten strangers with guilty consciences on an island, and then knocks them off one by one. Community Players' take on "And Then There None" plays September 1-4, 8-11 and 15-17, with Thursday, Friday and Saturday performances at 7:30 pm and Sunday matinees at 2:30 pm. Tickets range from $6-12. Community Players will also hold auditions for its next production, the sweet and funny Catholic coming-of-age musical, "Do Patent Leather Shoes Really Reflect Up?" September 11-13 at the theater on Robinhood Lane. Brian Artman directs. Tickets are now on sale for ISU's fall season, including Shakespeare's "The Merchant of Venice," which takes the stage at Westhoff Theatre on September 29th, directed by Jeremy Garrett, and "The Women of Lockerbie," a modern story with all the sorrow of a Greek tragedy, coming to the Center for the Performing Arts on September 30th. Click here for more information about ISU's School of Theatre. As long as you're plotting out your fall schedule, you should know that tickets are available September 6 for the Illinois Voices Theatre/McLean County Museum of History annual Evergreen Cemetery Discovery Walk, featuring ten colorful characters from Bloomington-Normal's past. This year, all these folks are connected to the Civil War in honor of the 150th anniversary of its opening battles. The Discovery Walk happens October 1-2 and 8-9, but you'll want to nab your tickets now, either at the Garlic Press, Evergreen Cemetery or the Museum itself. 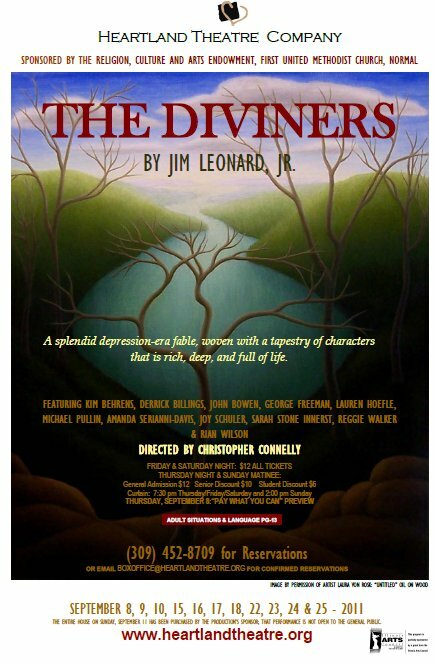 Heartland Theatre opens its second show of the 2011-12 season on September 8th when Jim Leonard Jr.'s "The Diviners" opens. This popular play, sponsored by the Religion, Culture and Arts Endowment from the First United Methodist Church in Normal, looks at a former preacher whose faith is tested when he arrives in a small, drought-stricken Indiana town during the Depression and meets a special boy with "divining" skills. Christopher Connelly directs a cast that includes Kim Behrens, Derrick Billings, John Bowen, George Freeman, Lauren Hoefle, Michael Pullin, Amanda Serianni-Davis, Joy Schuler, Sarah Stone Innerst, Reggie Walker and Brian Wilson. "The Diviners" opens September 8th on "Pay What You Can" night, with regular performances from September 9-11, 15-18 and 22-25. Click here for reservation information. CUTC (the Champaign-Urbana Theater Company) is holding auditions for the 2nd "Rocky Horror Show" in concert. If you've always had a hankering to do the Time Warp again, auditions are Saturday, September 10th from 11 am to 5 pm, and Sunday, September 11th, from noon to 3 pm, with callbacks Sunday at 6 pm, all at the CUTC office on Cunningham in Urbana. The performance itself is scheduled for Saturday, October 22 at Urbana's Canopy Club. You can see all the details here. Have you been keeping up with New Route Theatre's intriguing "One Shot Deal" series, where local actors and designers put on one-night-only performances of plays with social and cultural significance? September's "One Shot" is "My Name Is Rachel Corrie," a ripped-from-the-headlines, true-life play about an idealistic 23-year-old from Olympia, Washington, who ended up a martyr for the cause of Palestinian freedom. "Rachel Corrie" will be performed at the Eaton Gallery, 411 North Center Street in Bloomington, at 7 pm on September 14th, followed by a panel discussion. Eureka College Theater, in cooperation with the Woodford County Historical Society, will offer its annual Cemetery Walk at Olio Township Cemetery at 2 pm on Sunday, September 18th. The production will feature Eureka College students portraying people who played important roles in Eureka area history. Illinois Wesleyan Theatre kicks off its fall season on September 27, when Lillian Hellman's searing "The Children's Hour," about lies, rumors and malicious little girls, opens in McPherson Theatre. Thomas Quinn directs this "Children's Hour," with performances from September 27 to October 2. If you are a Tennessee Williams fan, Parkland College in Champaign has two shows for you. It's all called "Tennessee100," with two separate evenings of short plays, offered in celebration of the 100th anniversary of Williams' birth. You can see "The Long Goodbye," "The Municipal Abbatoir," "Adam and Eve on a Ferry" and "This Property is Condemned" on September 28 and October 1 and and 7 at 7:30 pm, or "Summer at the Lake," "In Our Profession," "The Chalky White Substance" and "Mister Paradise" on September 30 and October 6 at 7:30 pm and October 8 at 3 pm.